Arrows come in more different styles and varieties than any other piece of archery kit, so it’s important you know all about types of arrows and types of arrow tips and what to use them for. 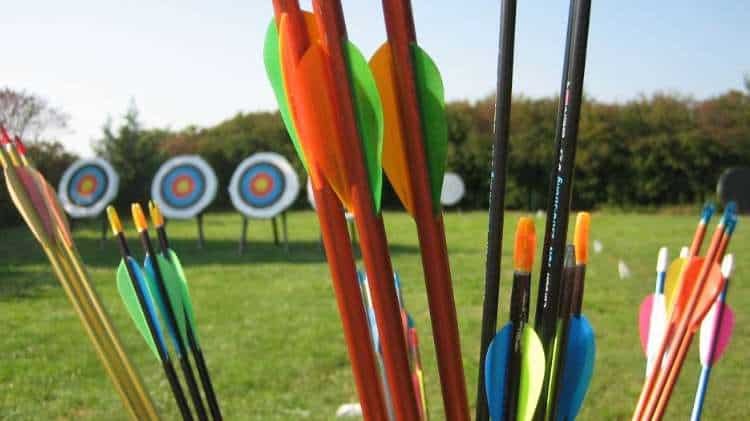 In this article we take you through the different parts of an arrow, the shaft types, point types and vane and fletch types available for both recurve and compound target archers and hunters and some things you need to know before purchasing. Point This is the front of the arrow, the bit that hits the target (all being well). Shaft The stem or body of the arrow connecting the point to the nock and fletch or vanes. 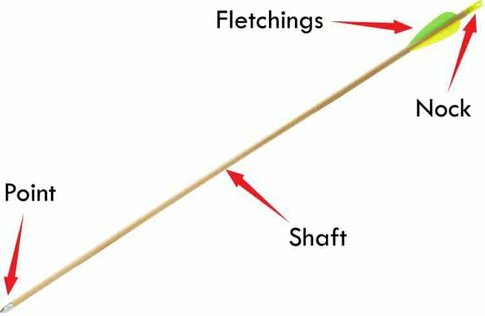 Fletchings The (commonly) 3 feathered or plastic vanes at the rear of an arrow to assist with flight. Nock The tiny groove on the rear end of the arrow which fits over the string. Some arrow shafts come with fixed points, some allow different types of point to be glued INTO the shaft, points can also be glued ONTO the shaft and some shafts allow screw in arrow points so that the shaft and point can be added and removed as you like to repurpose the arrow. Normally repurposing an arrow is something that only a hunter would do and target archery arrows more often come with fixed or glue in points. The diameter of the tip of the arrow should be the same or smaller than the diameter of the shaft of the arrow, otherwise this affects the aerodynamics of the arrow and causes it to snag in targets. A flat or blunt arrow point used normally in hunting designed to kill small game by blunt force. Some blunts come with a rubber head that is a larger diameter than the shaft with small spikes, others are just a flat blunt end. A sharp tipped arrow point with a built-in barb used for catching fish. with a bow (bowfishing). ​Wide flat bladed points that should only be used for huntin﻿g. This type of point causes an arrow to fly differently than other types of point as it introduces more surface into the aerodynamics of the arrow. A broadhead is designed to cause large wounds in the target and modern quality broadheads are as sharp as surgical tools. The most expensive arrows you can buy are made of an alloy core that keeps weight down and adds stiffness, which is then coated with carbon fibre for strength and further stiffness. An aluminium arrow is normally hollow to reduce weight and the spine value on this type of arrow will denote the thickness of the aluminium and diameter of the shaft and also the weight of the arrow. They are heavier than carbon arrows and normally won’t fly as far or as fast, stiffer and easily breakable, but safer as there is no splintering when they break. They are also easier to cut to size than carbon. Fibreglass arrows are some of the cheapest arrows available and reside normally at the bottom end of the price range, these are normally used for toys or very cheap low power introductory bow sets. All arrows have vanes or fletches, and normally there are 3 spaced equally around the nock end of the arrow. The purpose of fletching on an arrow is to introduce spin and stabilize the flight of the arrow. Some arrows may have 4 vanes to allow for lower profiles and more spin but this is generally reserved for hunters using broadhead points. Vanes can come in packs of different sizes, a full set of 12 arrows would require 36 vanes however vanes often come off or become damaged so purchasing spares is always a good idea. Plastic vanes are stiffer than feather vanes and the favorite of Olympic outdoor archers. They can be purchased in varying profiles with low-profile vanes introducing less wind-drift than higher profile ones. Plastic vanes are also waterproof and suffer none of the issues of feather vanes when shooting in the rain. Arrow vanes can be curved shaped so that if you look at them from the back they resemble the blades of a fan, this causes the arrow more inflight spin which adds to stability. This type of fletching is more expensive than regular straight vanes and can be difficult to apply and easily broken. Nocks are the small (usually plastic) ends of the arrow that are are grooved to allow locating the bowstring on the end of the arrow before shooting. Some nocks can be glued onto the arrow, some can be glued into the arrow and some, like points, can be threaded into the arrow shaft and removed again, and some have manufacturer specific fitting which will only work with that manufacturers arrow, picking the right type of nock is normally determined by the type of arrow shaft you are using. Once you know your arrow length, if you’re a target archer you’ll ideally want the lightest and smallest arrows you can shoot. A hunter will make a different decision based on the need for the arrow to penetrate into prey, however target archery only requires the arrow to stick into the target. We’ve rounded up some of the best arrows available in these 2 guides one for hunters and one for target archers. Your arrows MUST be long enough otherwise you run the risk of drawing back too far and your arrow falling off the rest and potentially shooting somewhere you just didn’t intend for it to go. ​Arrows will normally come in batches of 10 or 12 as purchasing a batch will mean you are getting 10 or 12 arrows produced at the same time on the same machinery which will allow for less inconsistency between their makeup. Although that tiny level of difference will only matter to a very experienced archer it’s useful to understand just why you see arrows offered in batches in stores rather than sold individually. You can either buy ready to use arrows OR you can purchase the component parts individually and assemble them yourself. Ready made arrows can be cheaper than the sum of their component parts purchased individually but allow for less personalization. As a novice archer ready to use arrows should be your preferred choice. I found an arrow with a nock that just goes to a point. It does not have any grooves in it and doesn’t have any threads. What kind of arrow is this? Sounds like an aluminium arrow without a nock fitted to it yet. These can have cone shaped ends ready to glue or press fit a plastic nock onto. This post is so nice and informative! Thank you very much for posting.